Reggie Fils-Aime is retiring from Nintendo, his last day will be April 15th. He’ll be replaced by a Bowser – Doug Bowser that is. Bowser is currently Nintendo of America’s Senior Vice President of Sales and Marketing. 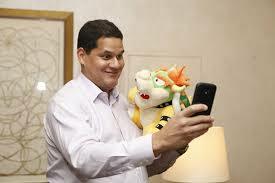 Reggie joined the company in 2003 and worked his way up the ladder, becoming almost as iconic to the company as Mario himself, and probably more iconic than Kid Icarus. Reggie felt very Nintendo, while adding his own personal spin on the brand. Heck, how many corporate bigwigs are known by their first name? He provided a wonderful balance of goofy charm and reliable leadership. Fans knew he was a solid presence at the top of the heap while still engaging in a fun, personable manner. Much like Nintendo’s games, he was serious about play. I’ll miss Reggie. He was a friendly face in an era full of cynicism towards big game publishers. He was genuine and positive. And he could present the silliest Nintendo ideas with sincerity and a lack of cringe that cannot be overstated. Good luck in your future endeavors Mr Fils-Aime, you can be replaced in title, but never in spirit. Reggie leaves Nintendo on a high note, after the extremely successful launch of the wonderful Nintendo Switch. Here’s our latest stream enjoying the brilliant Splatoon 2.